▲ The aftermath of the explosion. Photo courtesy Fire and Safety Department. Yesterday (Jan. 25) a boiler exploded in Oedo causing injury to two people and damaging much of the building. The explosion was so large that according to Jeju Sori it was heard in places over one kilometer away. 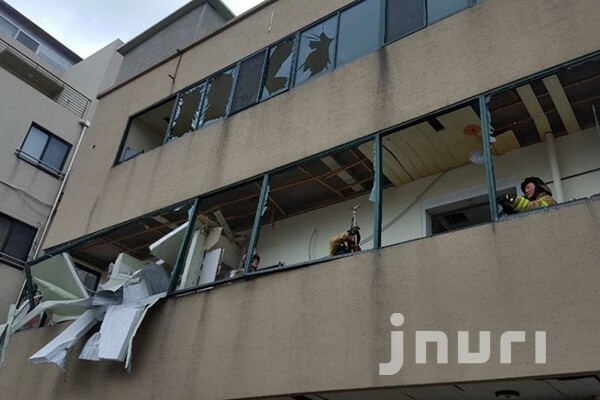 According to the Jeju Fire Protection Headquarters, the explosion occurred at 10:06 am on the second floor of a three-story building. Luckily, the explosion did not cause a fire. Two people who were in the apartment at the time were injured by fragments and were transferred to a hospital in Jeju City. The interior of the building was damaged by the explosion. Also, the windows of the shops on the first floor were also broken. Cars parked nearby were also damaged by the impact of the explosion. The fire department is on the scene and is trying to figure out the exact cause of the accident.